A cylinder musical box playing 8 airs as listed on replacement tune sheet. 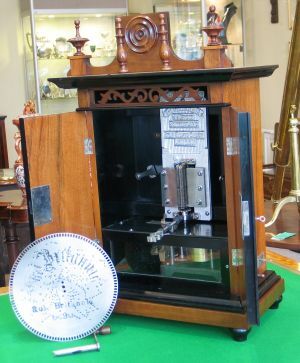 15 cm cylinder with 3 bell accompaniment. 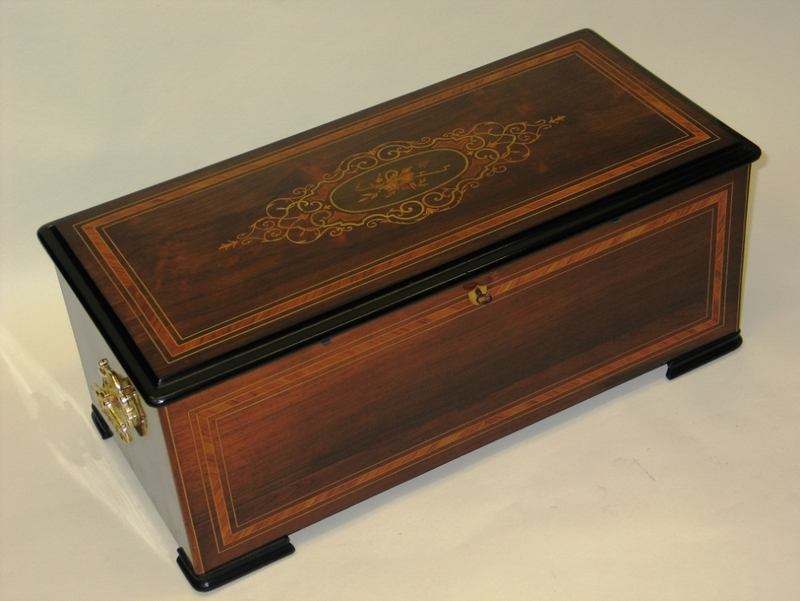 Brazilian Rosewood veneer to front and lid with musical trophy inlay. Tulipwood crossbanding, boxwood stringing, faux rosewood effect to sides, Replacement key to lock, sold with a 2 year guarantee. A cylinder "Buffet"style musical box by MMC (Mojon Manger & Co) of Switzerland C1890 no 31539. The 'Alternate Tip' cylinder musical box, cylinder length 33cm plays 12 airs as per original tune sheet, double spring motor. 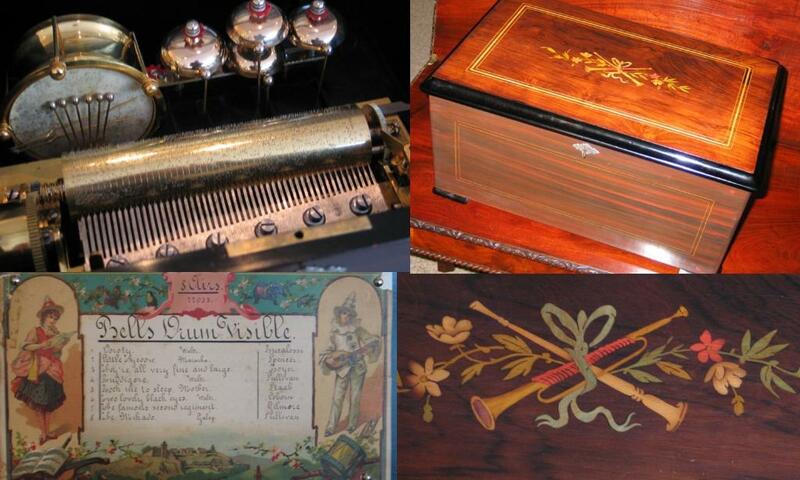 Case and mechanism professionally restored. Sold with a 2 year guarantee. Disc musical box by "Regina" of America C1900. 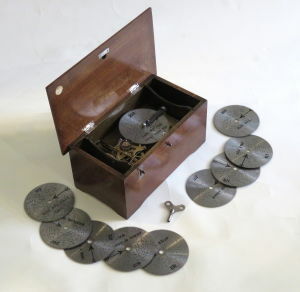 Twin comb mechanism to play 15 1/2 inch / 39cms diameter discs, supplied with 10 . The mechanism, now professionally serviced, is fitted into the original "Rococo" style case. 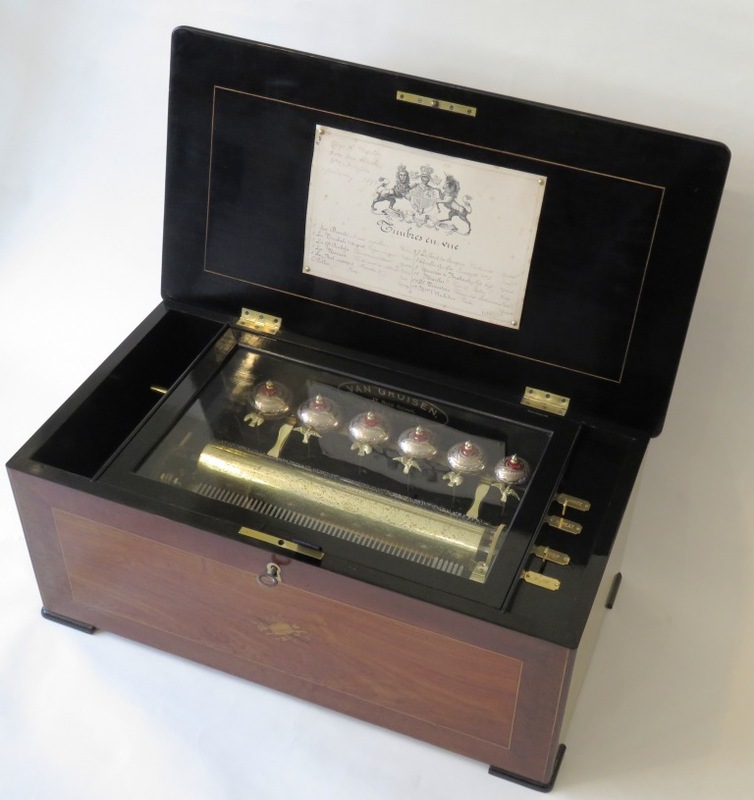 A Swiss 6 “Bells in Sight” or “Timbres en Vue” cylinder musical box by George Bendon made for the British market. 30cm cylinder playing 12 airs as listed on original tune sheet, engine turned bells with cast brass bird strikers contained in a case with musical inlaid trophy to lid and front, boxwood stringing, Brazilian Rosewood veneer, maple border, ebonised feet. 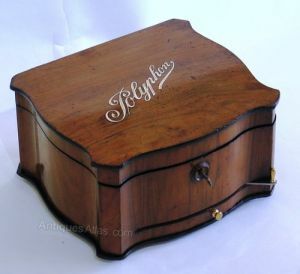 A disc musical box by Polyphon of Leipzig, Germany C1900, No. 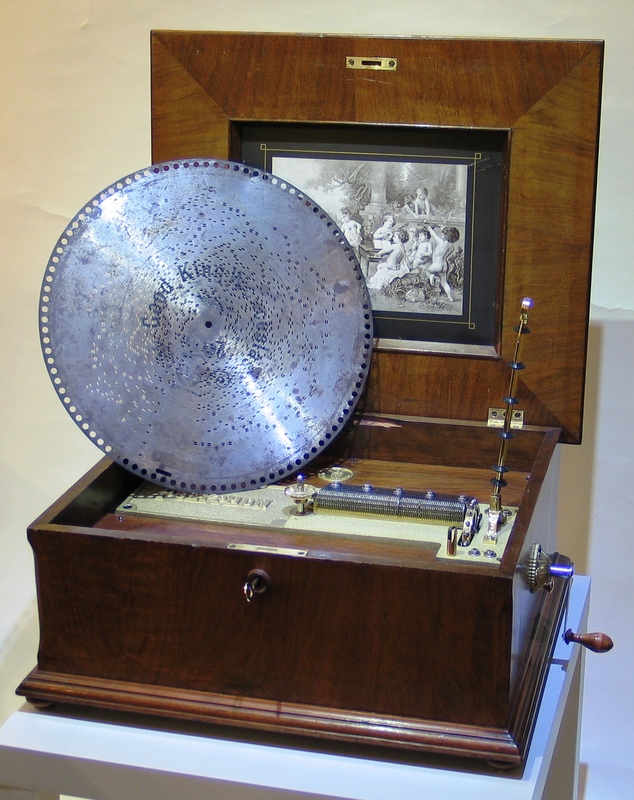 113515 playing 8 1/4 ins / 21 cm discs. Case repolished to a high standard, mechanism professionally restored. 10 x 9 1/4 x 6 1/4 ins. 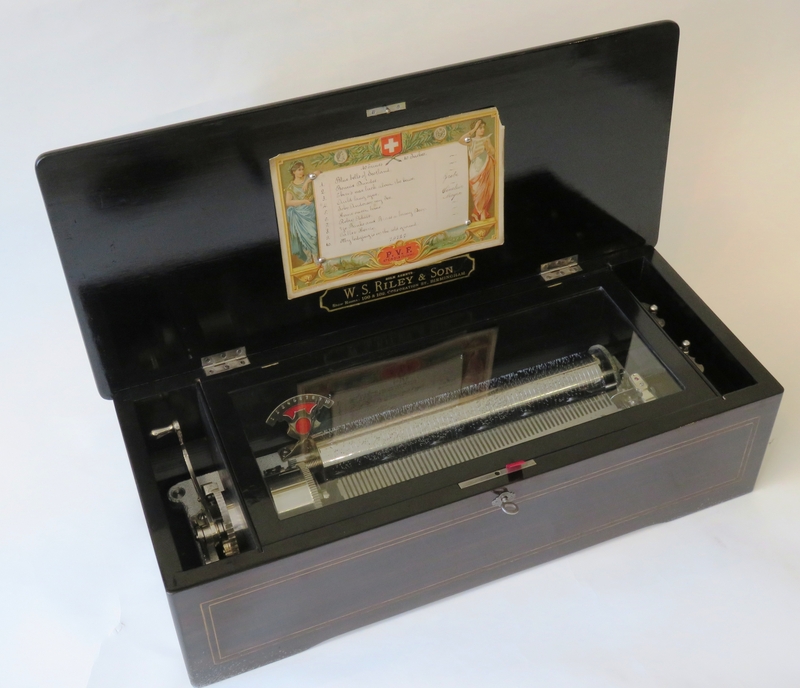 A Swiss cylinder musical box C1895 playing 8 airs on a 15.5cm cylinder, the tunes listed on original tune sheet. Case and mechanism restored. Serial no. 31898. 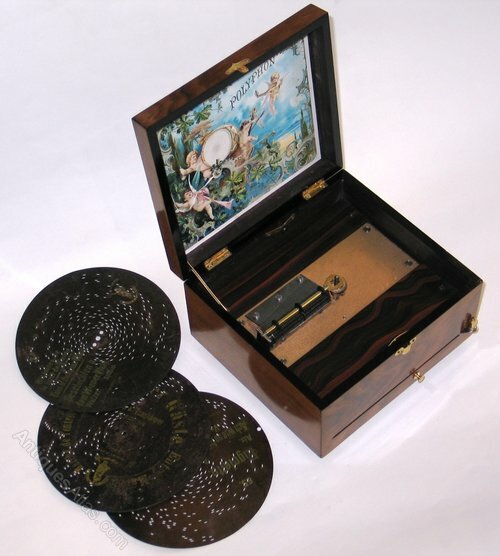 Disc musical box "The Britannia"
Disc musical box "The Britannia" by B.H.Abrahams of St Croix, Switzerland. Lever wound mechanism, transfer decoration to case. 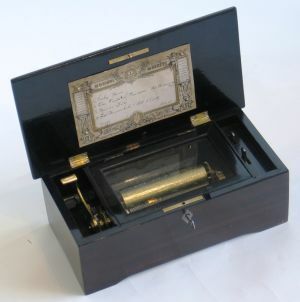 Case and mechanism professionally restored. 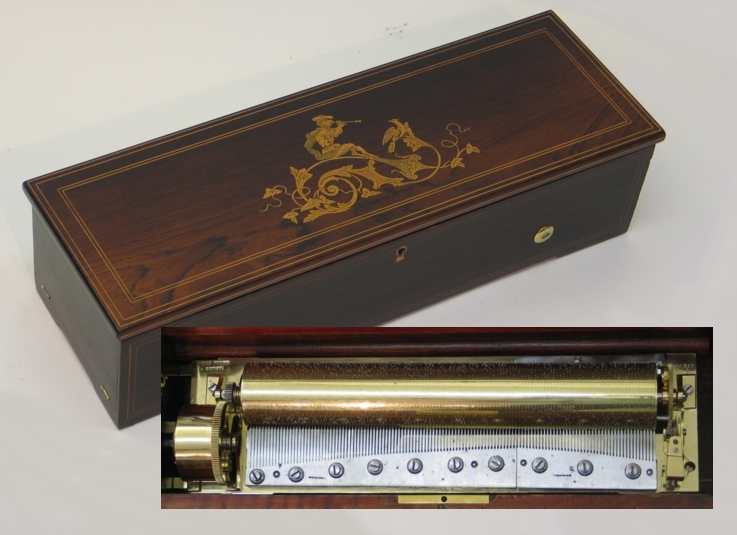 A cylinder musical box by Nicole Freres of Geneva, Switzerland, playing 8 airs as indicated on original tunesheet, serial number 52222. 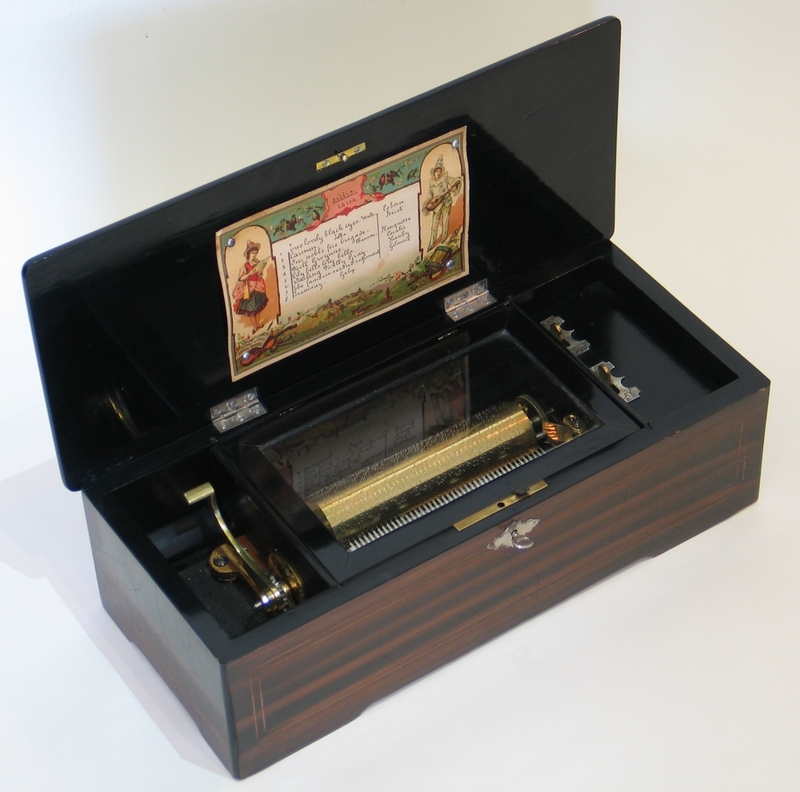 Case and mechanism restored. 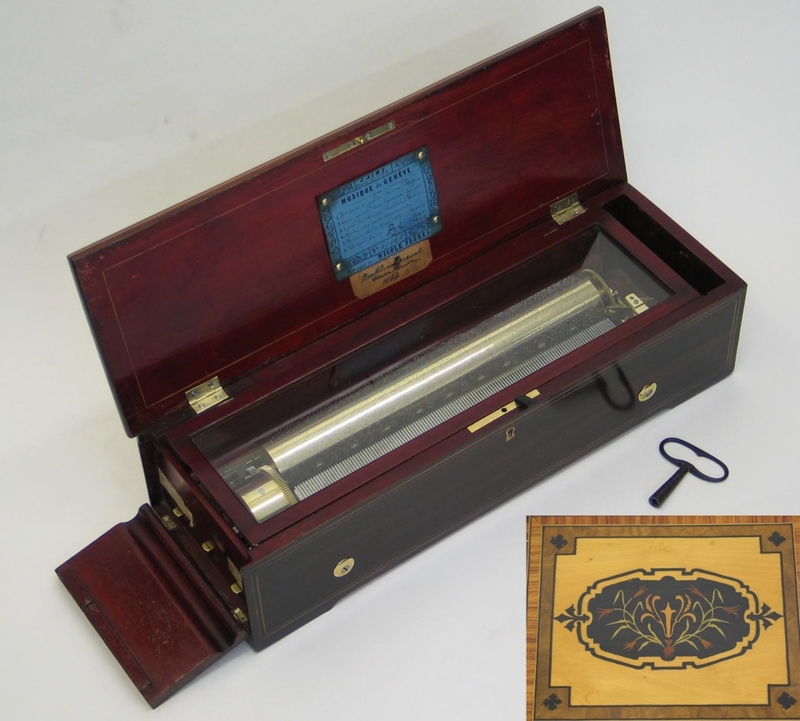 An interchangeable cylinder musical box by MMC (Mojon Manger & Co) no 28128 circa 1892, playing 24 airs from 4 cylinders (33cm/13 inches long) as listed on original tune sheet. 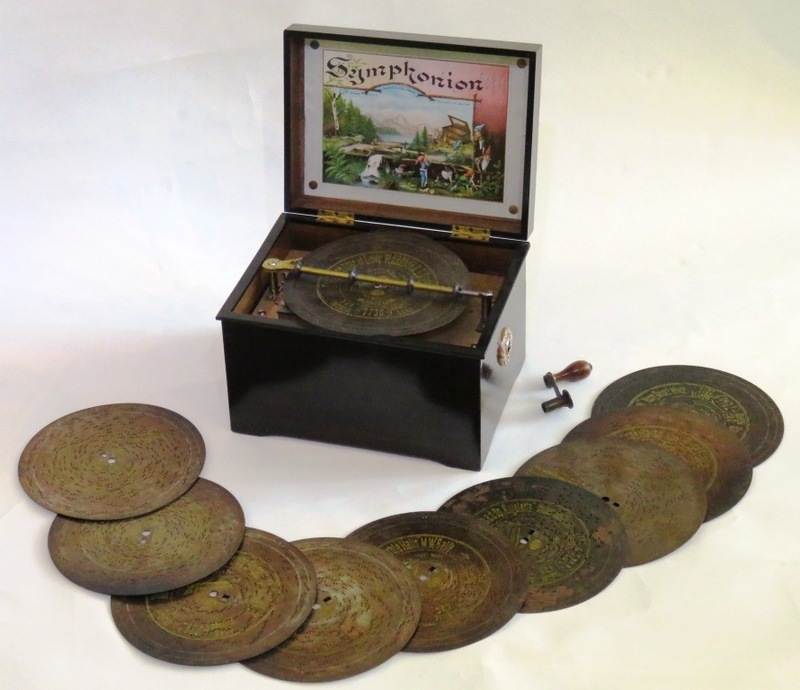 A disc musical box by "Polyphon" of Leipzig, Germany C1900. Serpentine shaped walnut veneered case, original French polish finish with faux ivory cartouche and stringing, ebonised edge. 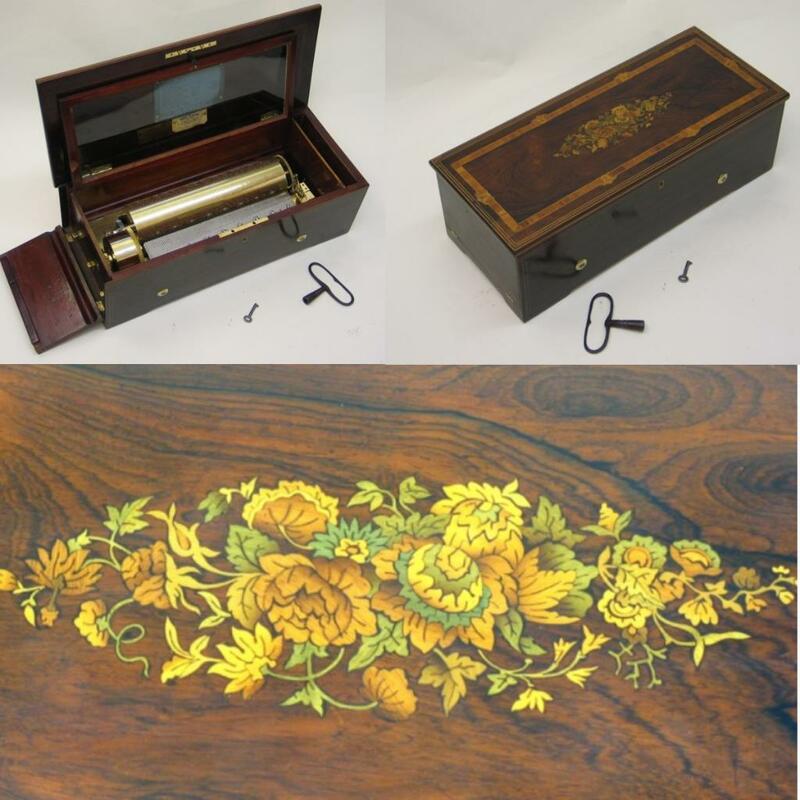 Mechanism recently and professionally restored. Supplied with 10 original 21cm / 8 1/4 inch diameter discs. A musical photograph album C1900. 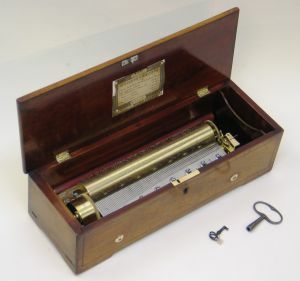 Small cylinder movement playing two airs on a 6cm cylinder. 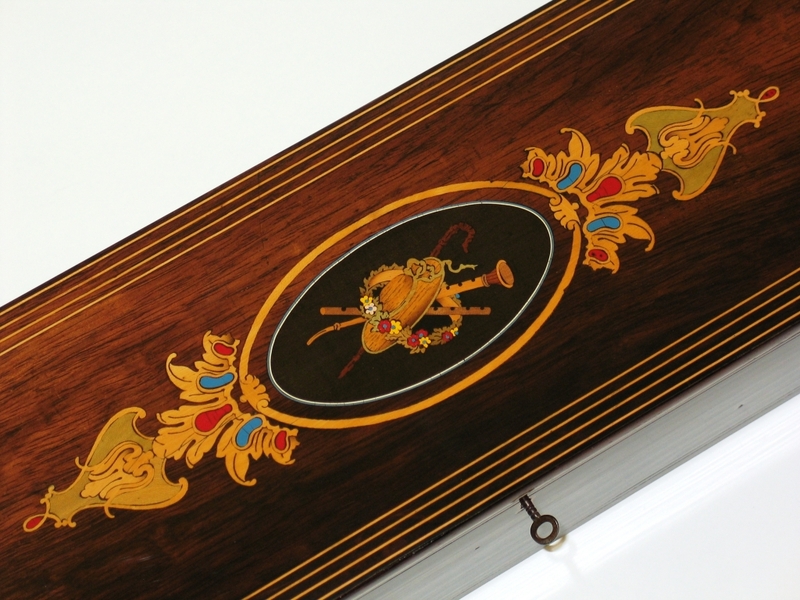 Art nouveau decoration to leather binding. 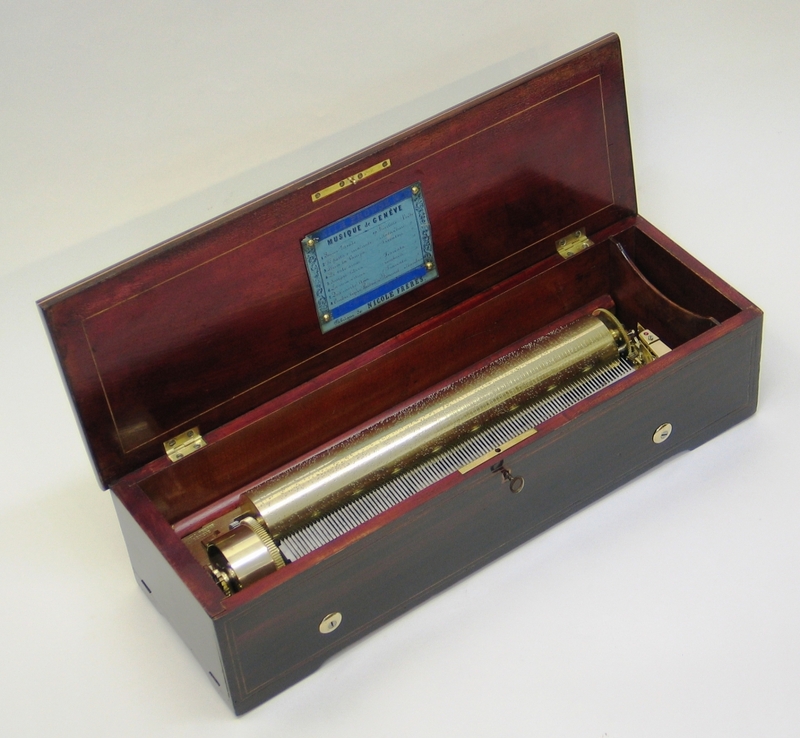 Movement serviced, minor restoration to the spine. 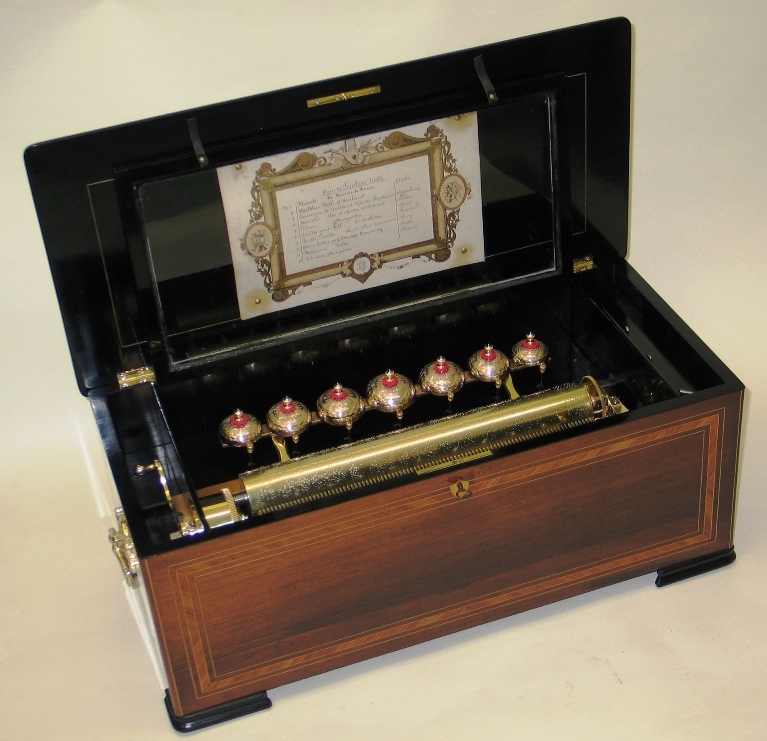 A cylinder musical box by L'Epee of S Susanne, France. 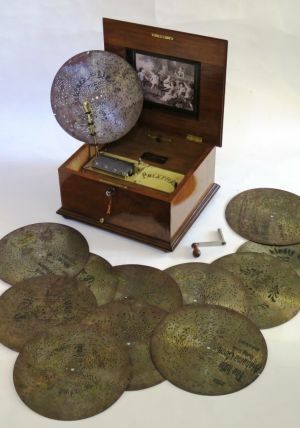 C1880 playing airs as indicated on the original tune sheet. 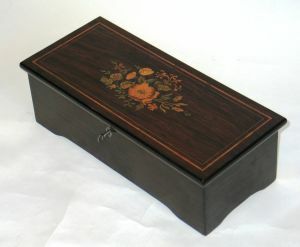 Brazilian rosewood veneer to lid with inlay decoration. 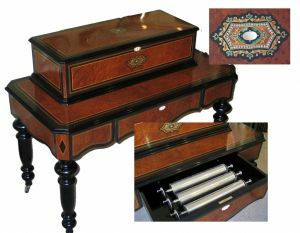 The beech carcass finished in typical faux rosewood finish. 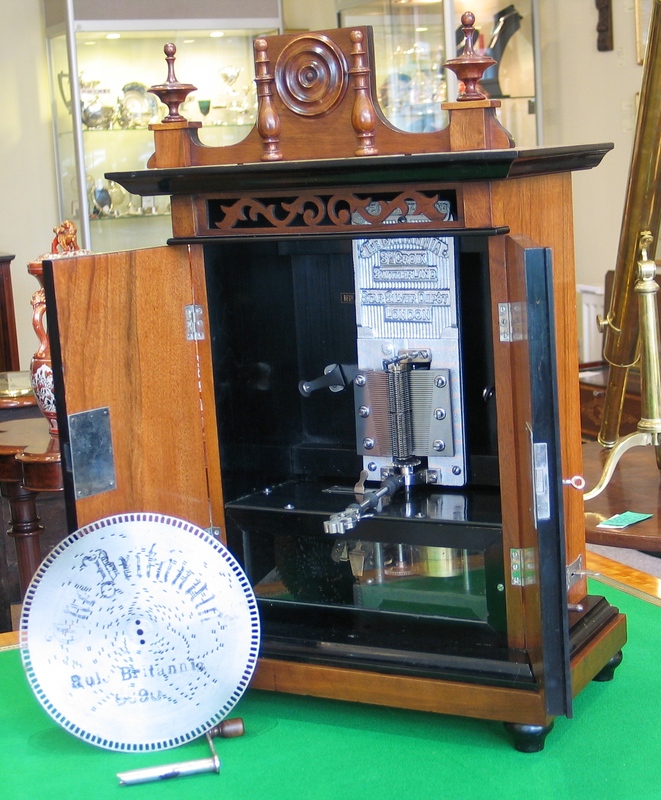 Key to lock, case re polished,mechanism recently serviced. 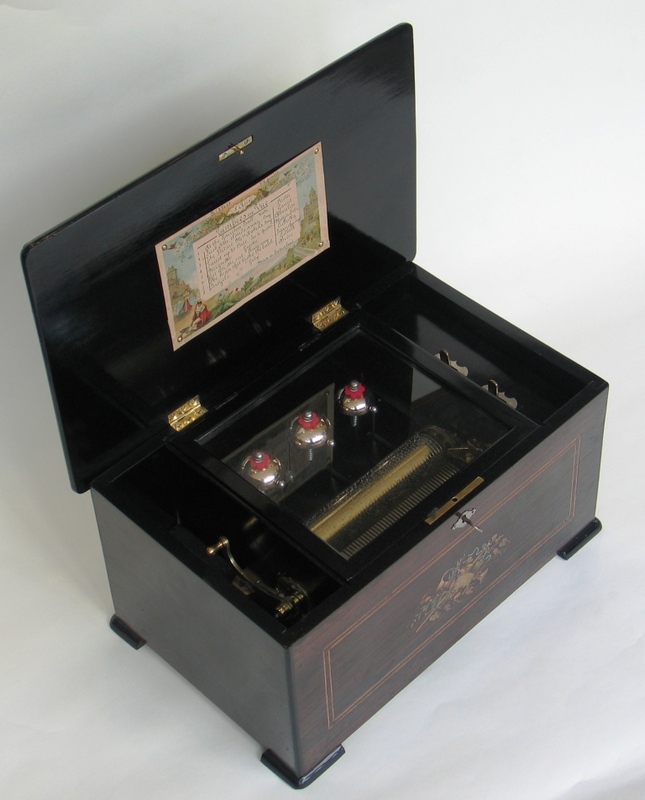 "The Britannia" mechanism is contained in a walnut veneered cabinet with pediment. Crank wound and complete with 10 original 9 inch discs. 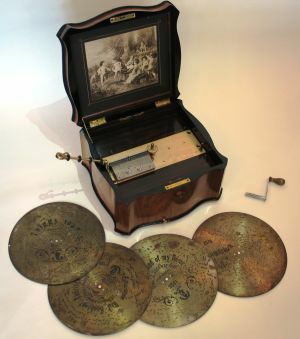 An early "exposed controls" cylinder musical box no. 10239. 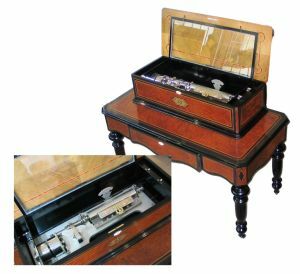 Fruitwood case, original finish, mechanism professionally serviced. 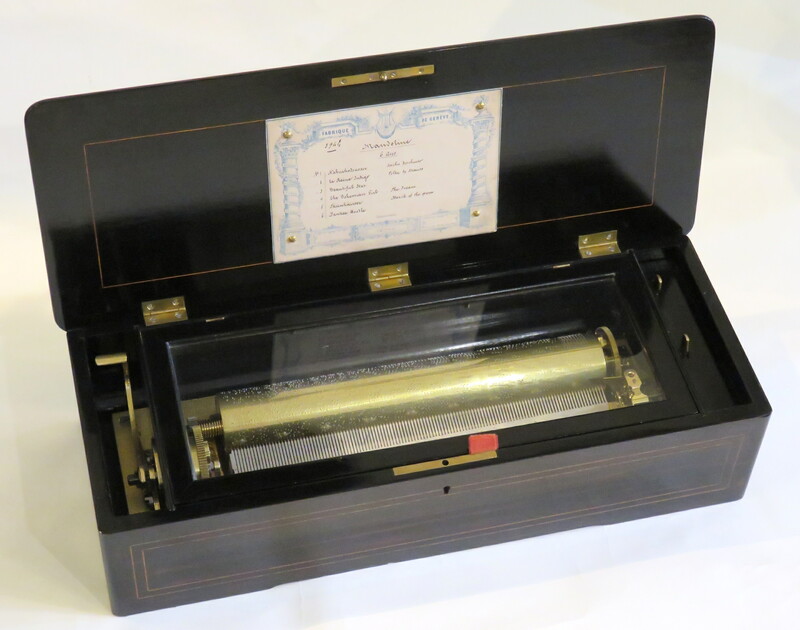 Serial number 33650, 16 cms / 6 1/4 inch cylinder. 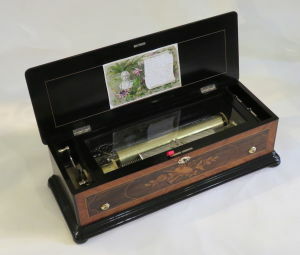 Mechanism recently and professionally serviced. A disc musical box by Polyphon of Leipzig, Germany, manufactured in January 1898. 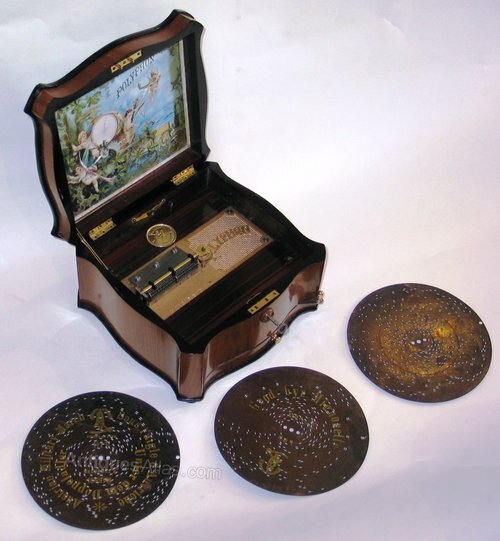 Walnut veneered case of typical form playing 19 5/8 inch/50cm diameter discs (10 supplied). 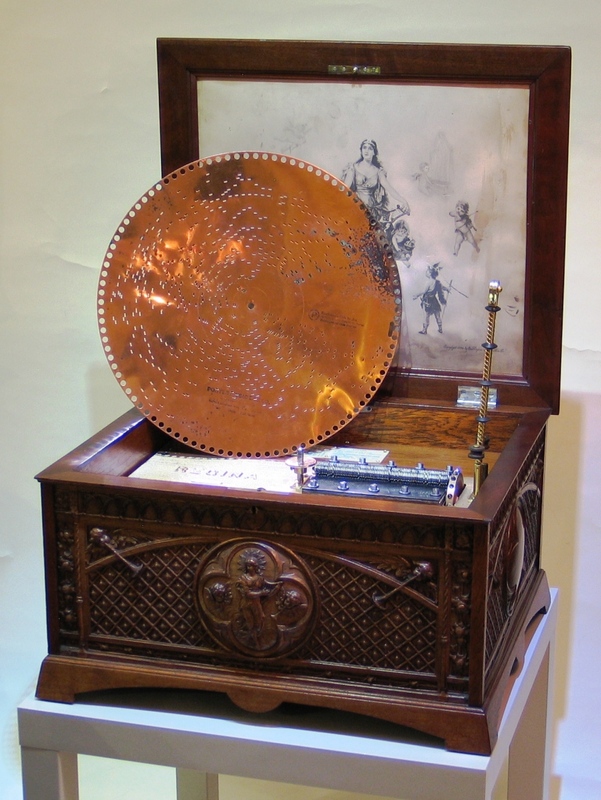 Case restored, mechanism serviced, supplied with a replica disc bin constructed in the manor of the original. 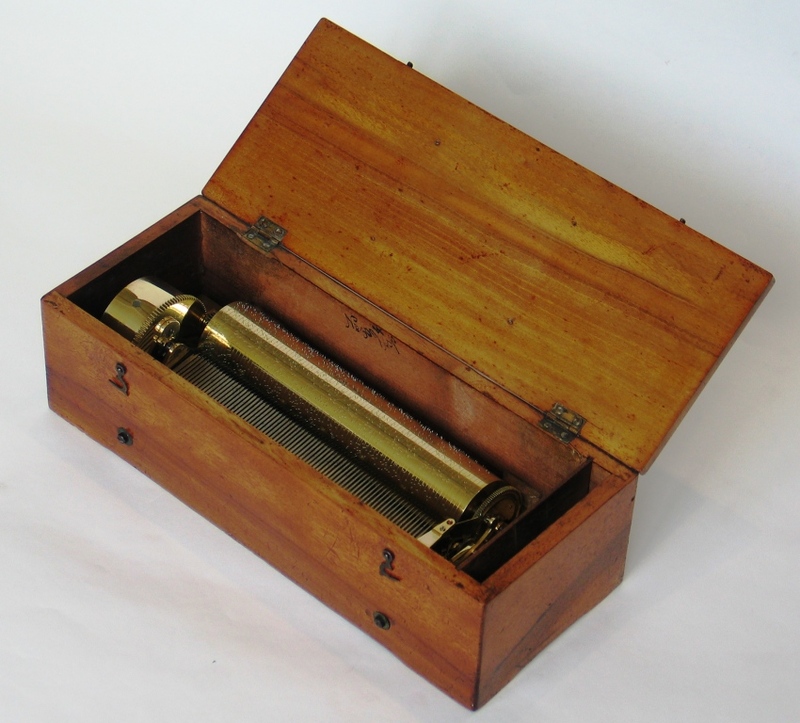 A cylinder musical box (key wind) by Nicoles Freres of Geneva, Swiss circa 1850. Serial number 31198, gamme number 1299. 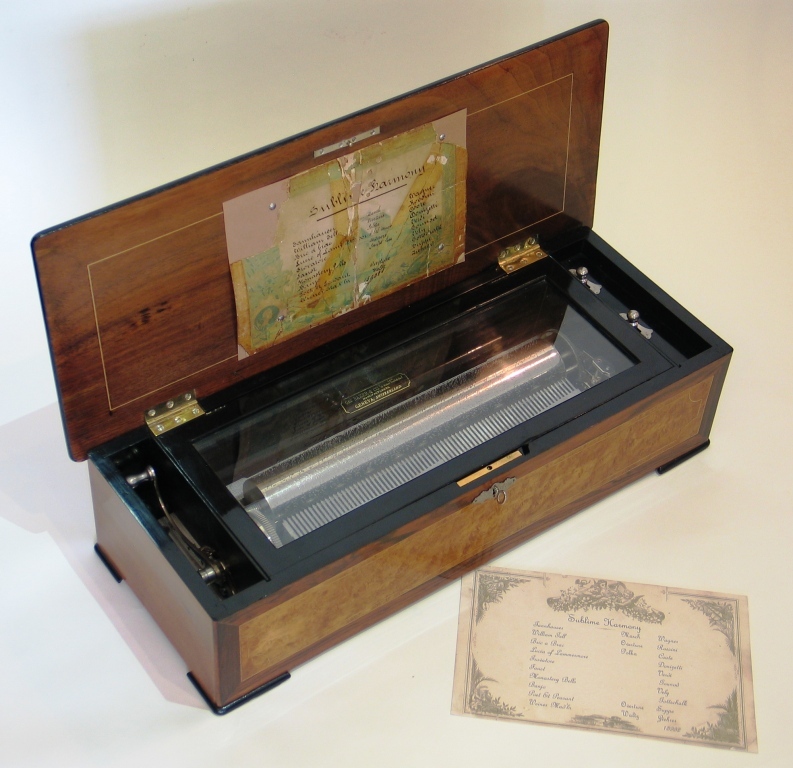 The 28cm cylinder plays 6 airs as indicated on the original tunesheet. 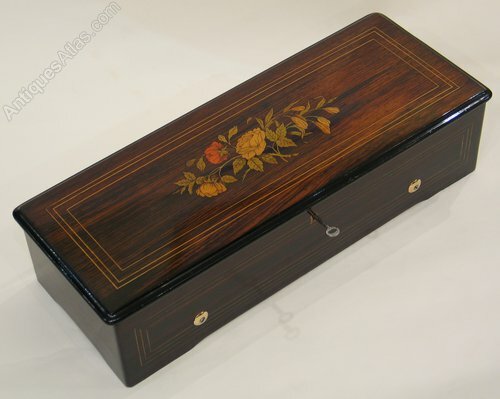 Plain fruitwood case, 17.5 inches (44.5 cm) x 6 inches (15cm) x 5.25 inches (13cm). No. 116280 playing 8 1/4 inch / 21cm discs. 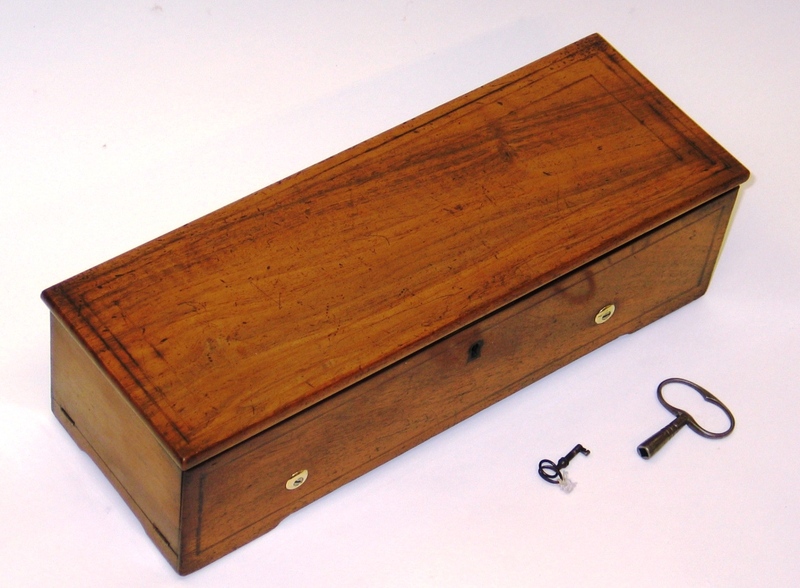 Walnut veneered serpentine case with replacement key. 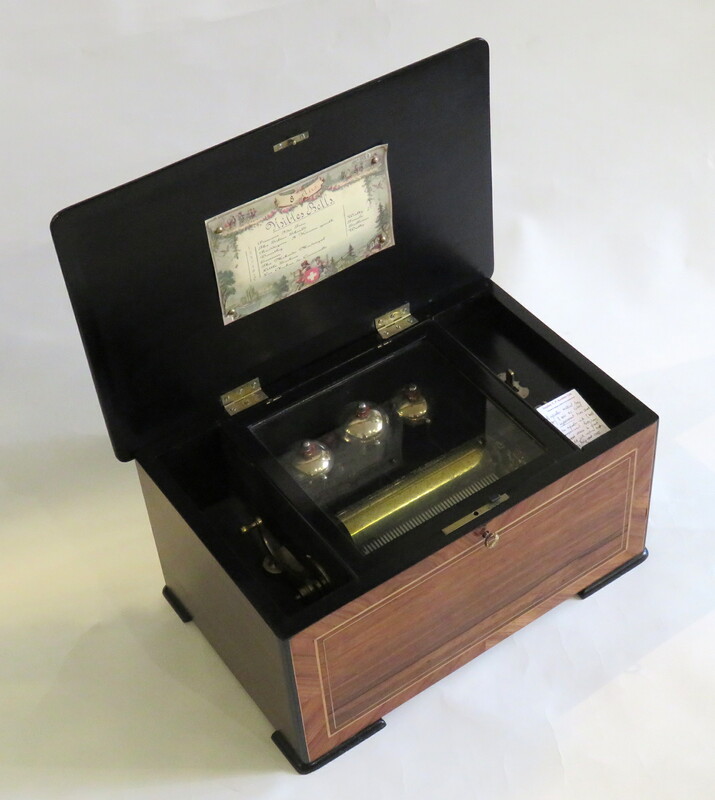 Case re-polished and the mechanism serviced professionally. 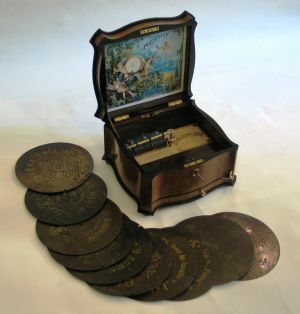 Supplied with 10 original discs. 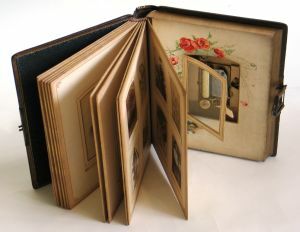 27.5 x 25.5 x 16 cms / 10 7/8 x 10 x 6 3/8 ins. Number 112185 playing 8 1/4 / 21cm discs in a walnut veneered serpentine case. 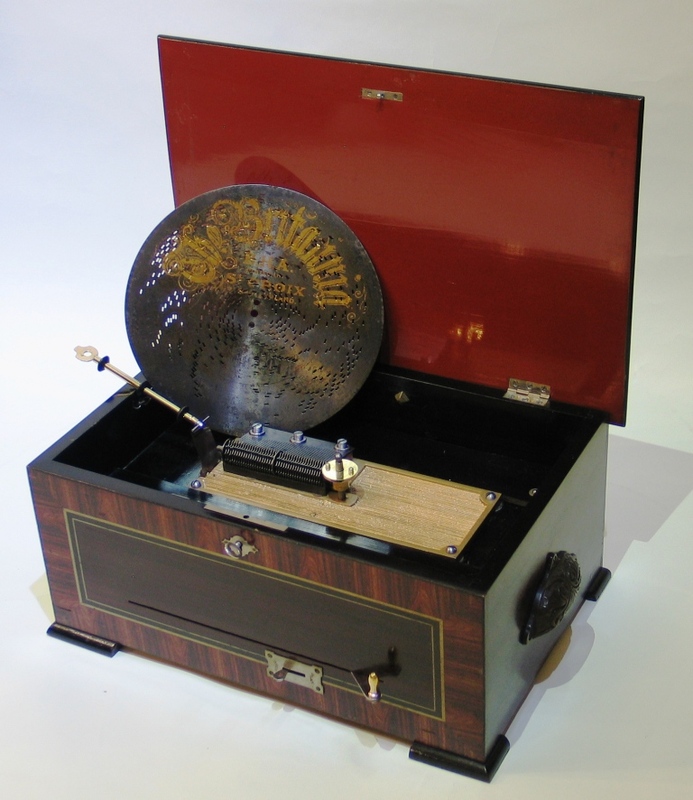 Mechanism professionally serviced and supplied with 10 original discs. 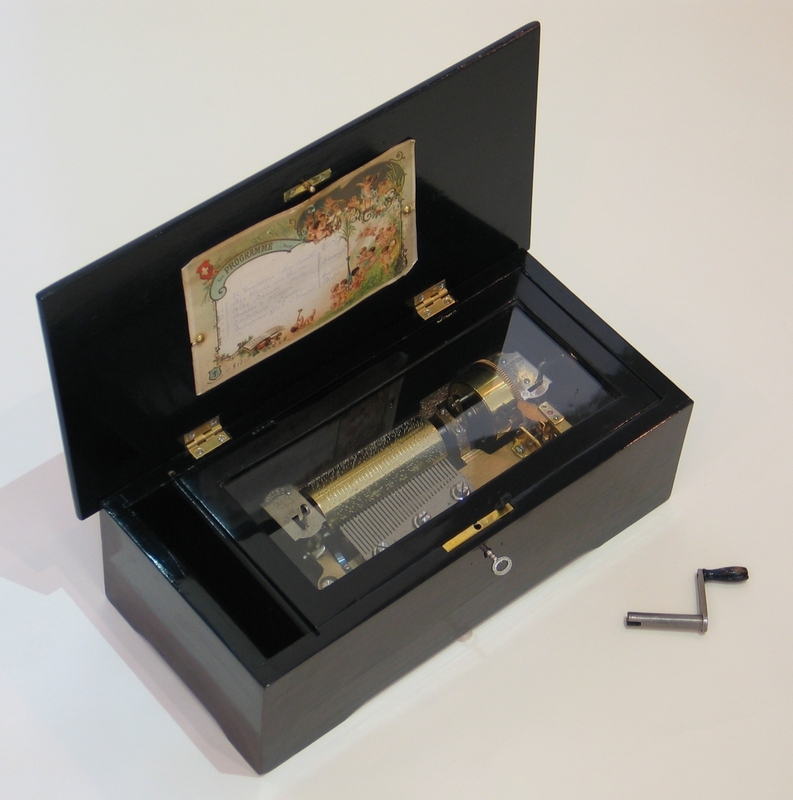 A cylinder musical box by Nicole Freres of Geneva, Switzerland. No. 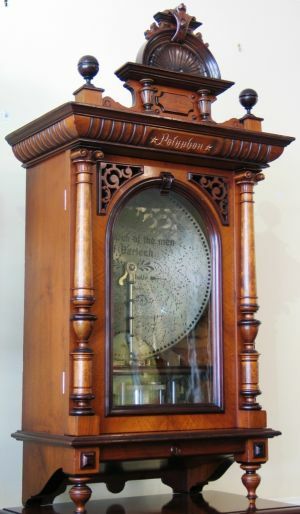 44867 C 1860. 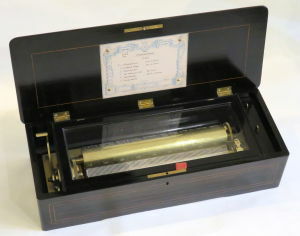 The 33.5cm cylinder plays 8 airs as listed on original tune sheet. 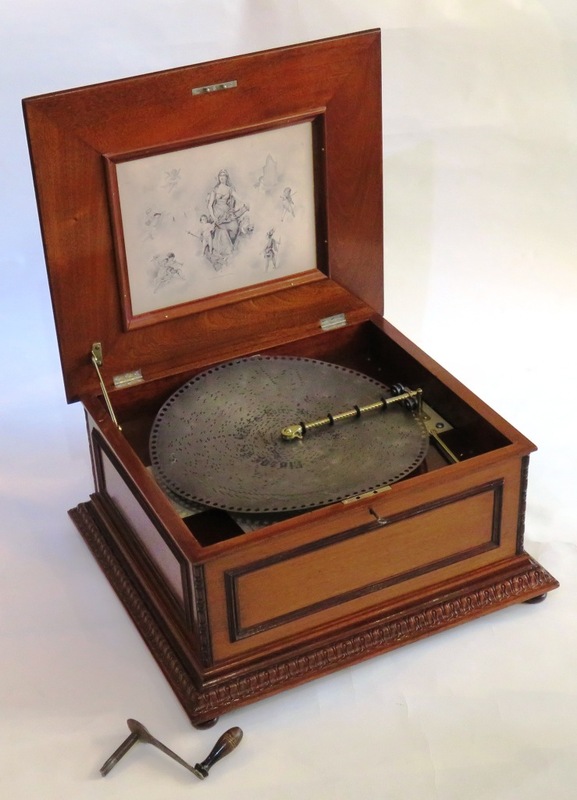 A disc musical box by Polyphon of Leipzig playing 28cm discs, Serpentine case, walnut veneer, case and mechanism restored, circa 1895. 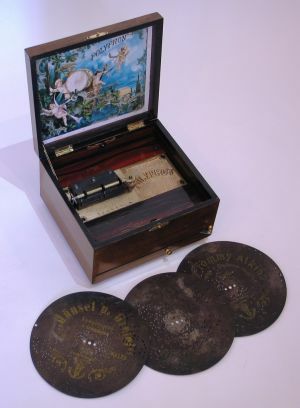 Supplied with 10 original discs, more available. 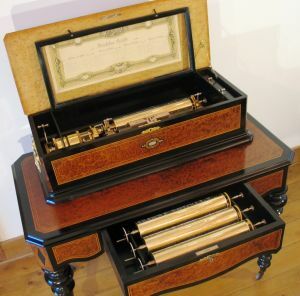 A cylinder musical box, ‘Forte-piano’ by Nicole Frères of Geneva no 37528 circa 1860. 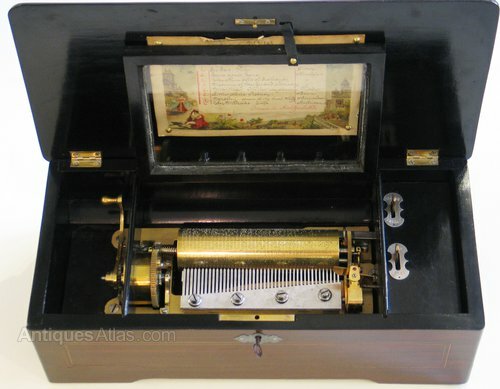 The “Forte-Piano” type of musical box has a loud comb and a soft comb. This would allow the arranger of the music to incorporate loud and soft passages into the music. The 33cm cylinder plays six airs as listed on the tune sheet, mechanism and case restored. 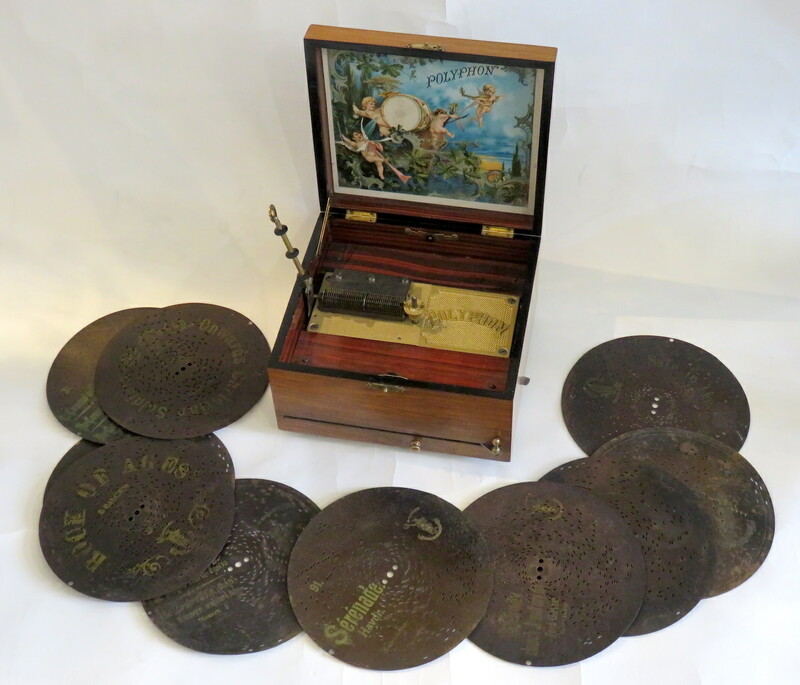 A rare seven ‘Bells in Sight’ cylinder musical box, swiss circa 1890,playing 10 airs as listed on original tunesheet. Mechanism and case restored. A cylinder musical box by Nicole Freres of Geneva, Switzerland, serial number 37009 circa 1855, playing 8 airs as listed on original tunesheet. Case and mechanism restored. 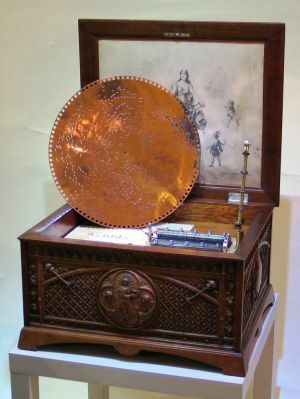 Stephen T.P. 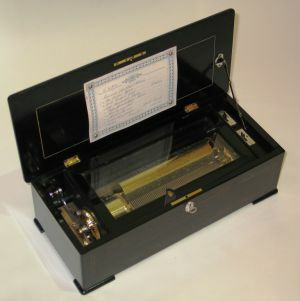 Kember B.Sc. (Hons) A.M.I. Mech. Eng. Wednesday to Saturday 10am to 4pm - NOW CLOSED ON SUNDAY, MONDAY and TUESDAY. 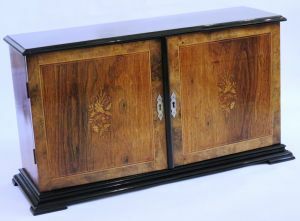 Shop; 01797 225989 (please leave a message if no reply), Mobile; 07850 358067.